The star power was dazzlingly bright on the 14th Annual Screen Actors Guild Awards® red carpet on Sunday, January 27, 2008, despite darkening clouds and intermittent heavy downpours, as film and television’s leading actors stopped to be photographed and interviewed by a record turnout of media from around the world under the protection of translucent tenting leading to the entrance of the Los Angeles Shrine Exposition Center, after Jon Tenney of TNT's The Closer opened the red carpet with the SAG Awards' signature Champagne Taittenger toast. The weather echoed the stormy state of the film and television industry as the Screen Actors Guild, under the shelter of an interim agreement with the striking Writers Guild of America, celebrated both 2007’s finest performances and the 75th anniversary of SAG’s founding on June 30, 1933. Joined by industry luminaries, this year’s SAG Awards® nominees, presenters and their guests traversed a golden hued tunnel punctuated by ivory and gold mirrored columns to enter a showroom inspired by the Golden Age of the Hollywood Movie Palace seen thorough a contemporary eye, in homage to the Guild’s Diamond Jubilee. At center stage, against a fiber optic star backdrop, a platinum-framed ‘silver screen’ displayed the moving images that honored SAG’s past, present and future. Throughout the evening Blair Underwood introduced filmed tributes which chronicled of the key moments in SAG’s history and celebrated the diverse actors who contributed to the Guild’s emergence as the nation’s largest labor union representing working actors. A prolonged standing ovation saluted SAG’s 44th Life Achievement Award recipient Charles Durning, who was presented SAG’s highest honor by Burt Reynolds, following filmed tribute introduced by Denis Leary. The live simulcast from the Los Angeles Shrine Exposition Center on TNT and TBS brought the Screen Actors Guild Awards® its highest ratings ever on cable.  The awarding of this year’s Actor® statuettes was preceded by the announcement from the SAG Awards® red carpet of SAG’s new honors for the outstanding performances by a stunt ensemble in television and film, which was webcast on TNT.TV and TBS.com’s live pre-shows. For the twelfth consecutive year PEOPLE magazine and the Entertainment Industry Foundation (EIF) celebrated actors’ work both on and off the screen by hosting the official SAG Awards™ Gala on the backlot of the Shrine. Gold urns of white roses and an architectural center superstructure of covered with roses and greenery contrasted with the soft grey fabric lining the expansive tent and covering the intimate conversation groups. Large video monitors displayed a photo montage compiled by PEOPLE magazine, saluting the legacy of Screen Actors Guild in honor of SAG’s 75th Anniversary. Guests stayed well into the night meeting, mingling, dining and dancing to a special performance by Grammy-award winning singer/songwriter Michael McDonald.